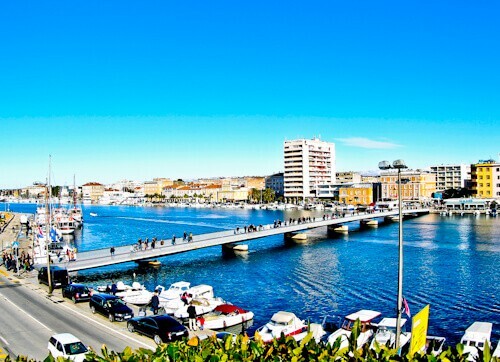 It’s likely you’ll find a good value Zadar hotel as there are lots of them. In addition many locals are renting out rooms and apartments, consequently Airbnb is popular here. You will not see another monument like the Monument to the Sun anywhere else in the world. During the day it is charging as it consists of solar panels. It looks like a huge blue plastic circle during the day which is fun for kids to run on. In addition to the circle you’ll hear the nearby sea organ playing sea music. As well as being called the Monument to the Sun, it’s also referred to as the Greeting to the Sun. 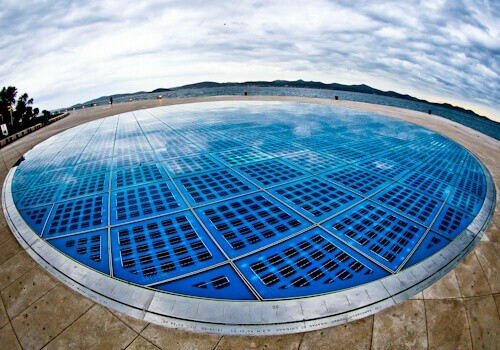 Throughout the day, the Monument to the Sun charges up through the solar panels. If you visit at night you’ll see the purpose of these solar panels and what they have been charging. The best time to visit is sunset when it changes from a blue plastic circle to a lights show. Comparatively, I would liken the lights on the floor to the Michael Jackson video to Billie Jean. They light up and seem to react to where people are standing. In the event that you visit the Monument to the Sun, it’s likely you’ll find it with people walking on it and taking selfies. To get the photo without people you must visit off season when the weather is cold! 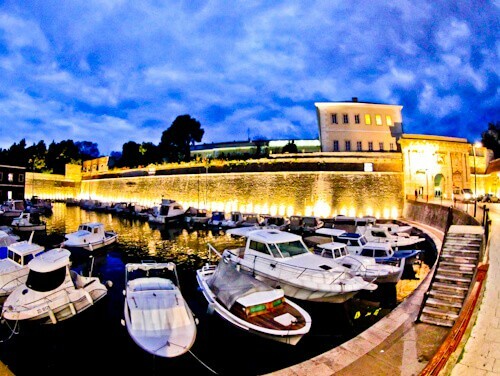 The sea organ Croatia is located alongside the Monument to the Sun. At first glance it’s just a set of stairs going into the ocean. In fact, underneath these stairs is a complex water organ system which enables the ocean waves to make sound. As waves are random, the ocean waves music is always unique. An alternative name for the sea organ is the ocean organ or water organ. 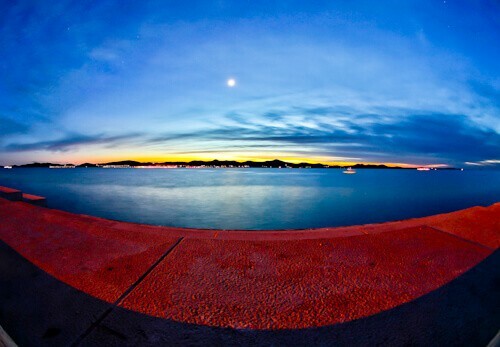 As well as the Monument to the Sun, the sea organ makes a wonderful sunset location in Zadar. 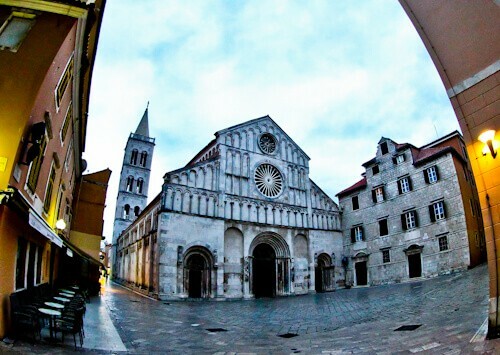 Zadar Cathedral is the largest cathedral in the Dalmatia Province. It’s also relatively quiet and worth going inside to admire the interior. The architectural style of the cathedral is Romanesque. 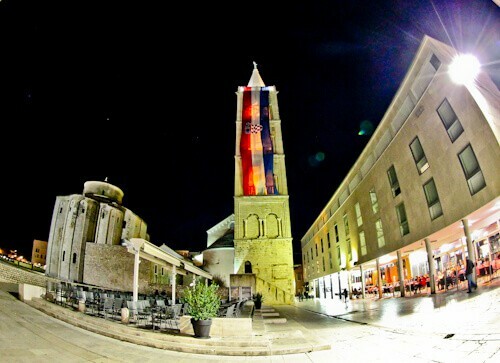 Zadar Cathedral has its own bell tower. It’s not as beautiful as the bell tower you’ll see in Pisa, Italy but the view is better! You can ascend to the top for a view of the city as well as the surrounding sea and islands. Entry is good value but you must walk to the top. The reward for doing a little exercise and climbing up the stairs is a beautiful view. A visit to the Roman Forum of Zadar is easy as it’s conveniently located in the center of the city. 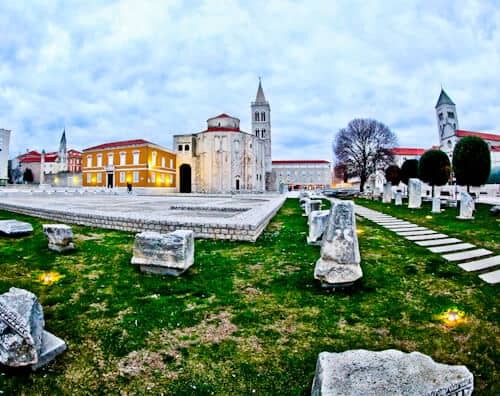 Zadar Roman Forum is located in between the Church of St Donatus, Zadar Cathedral and the promenade walk. The Roman Forum of Zadar has a city park feel as you’re free to walk anywhere and there are trees and benches surrounding it. It’s a good location to take photos as you have historic buildings on one side and the sea at the other. Additionally you’re in a 2000 year old forum! 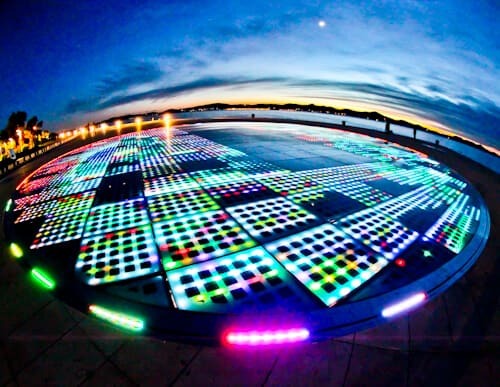 Zadar Croatia is one of the beautiful cities of the world which features city walls. It’s possible to walk around the city walls with a little part of the way on the promenade. Walking around the city walls is a good way to discover the city as you’ll pass by many of the points of interest mentioned above. In addition there’s a view of the harbor and Zadar new town. There are several gates to the city including Land Gate (above). 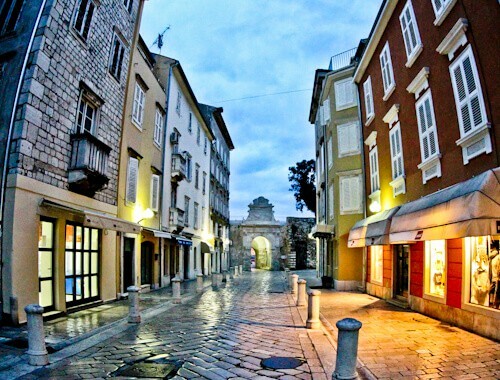 The streets of old town Zadar are mostly pedestrianized. You’ll come across lots of narrow winding streets and it’s likely you’ll get lost, but not for long as it’s a small town. It’s worth turning off Google maps to explore the old town. If you do get lost, it won’t be long before you reach either the sea ot the city walls. There are many Instagram worthy locations in the streets of old town Zadar. 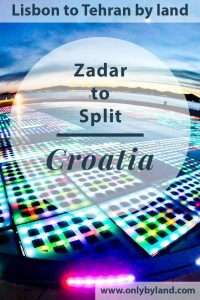 Zadar Croatia new town is an easy bridge walk from the old town. It’s worth walking over the bridge to explore it. 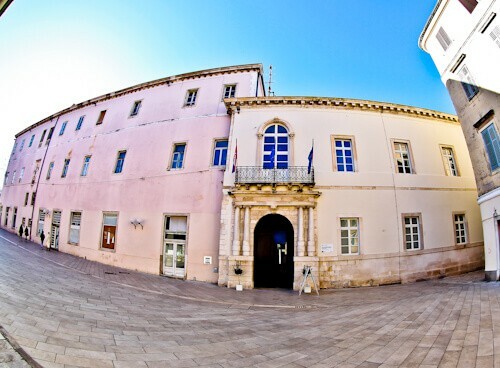 In addition if you see a Zadar hotel you like in new town you should stay there, as it’s an short walk. Lot’s of boat tours start from Zadar port, they’ll be tourist agencies selling these too. Duke’s Palace was a 16th century palace. It has been restored to its former glory and opened as a museum. As well as visiting the royal interior, there are often special exhibitions in addition to live events and shows. The Duke’s Palace website has information on the latest events and exhibitions. A lot of people ask, ‘does Zadar Croatia have a beach?’ The answer is yes and it’s a short promenade walk from the center. 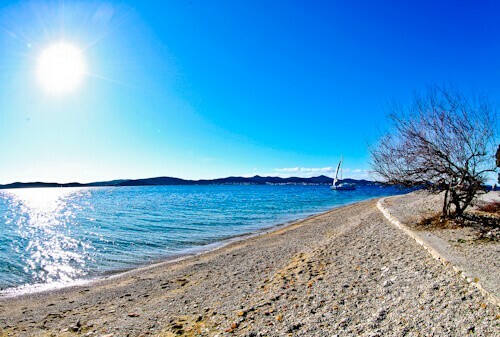 As well as Zadar beach there are boat trips to the beaches of the surrounding islands. Zadar beach has several restaurants and cocktail bars. The cocktail bars are good locations to watch the Zadar sunset from. 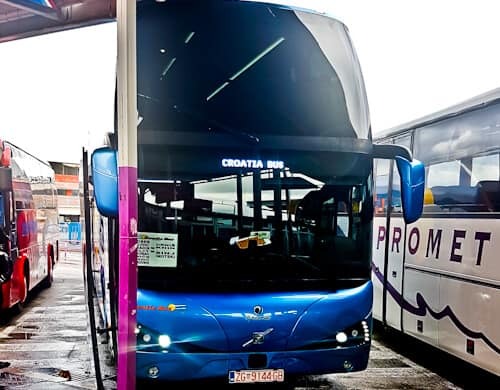 There are several bus companies running from Zadar to Split. I went with Croatia bus as the Flixbus was full, I’d recommend Flixbus for this route as their buses are better and prices more consistent. In addition the Flixbus offers free WiFi and phone chargers so you arrive at your destination on full battery! The journey time from Zadar to Split is around 2-3 hours.